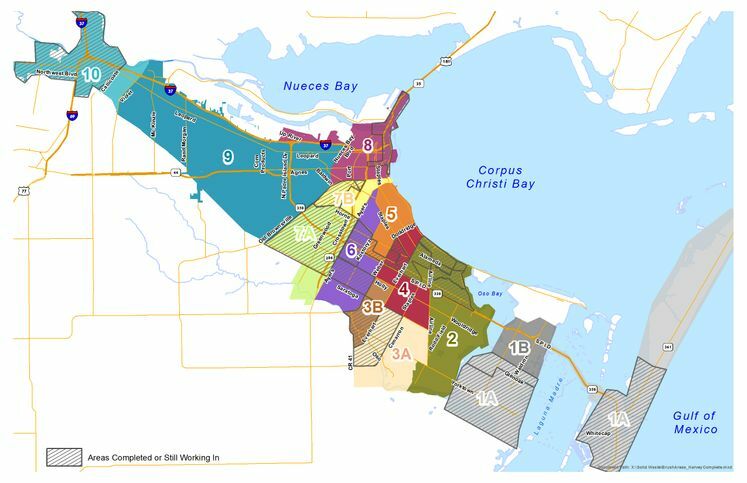 CORPUS CHRISTI, TX – As of Monday, September 18, crews have picked up 53% of the estimated total amount of storm debris in Corpus Christi. After Hurricane Harvey, there was an estimated 275,000 cubic yards of debris around the city. Under normal conditions, it takes 13 weeks to sweep the entire city. The Harvey cleanup effort has been underway for three weeks. The public’s continued patience is greatly appreciated. Please separate brush piles from bagged debris. Keep brush 100% clean because it will be ground into mulch. Please place clean brush, bulky items and appliances in separate piles. Please do not mix bagged brush, yard waste, or household garbage with clean brush, or stack bags on brush piles. Bagged debris or garbage cannot go in the grinder. Garbage should only be placed in green carts or brought to the J.C. Elliott Transfer Station. During a first pass, crews will only pick up brush. Construction material and other debris will be collected during a second pass. Crews will complete both passes before moving on to a new zone. Once all zones have been passed through twice, there will be an additional citywide sweep. Regular brush and bulky item pickup schedules will resume once all the storm debris is collected. For more information, contact Solid Waste Program Outreach Coordinator Celina Pulcher at (361) 826-1655 or by email at celina@cctexas.com.